Colonial Inauguration leaders give students their first introduction to GW at sessions over the summer. 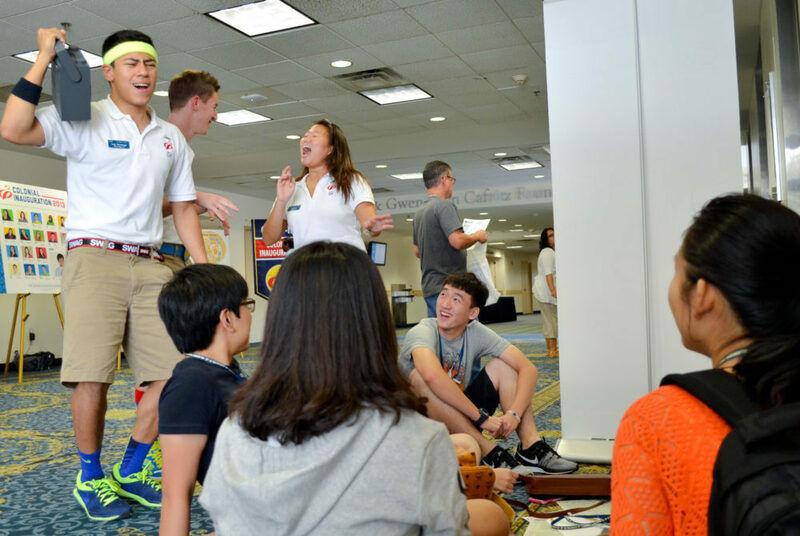 These CI leaders still remember the summer of 2014 wearing khaki shorts and colorful socks while orienting excited new students. Four years ago, they gave seniors tips for surviving their first year at GW, but they still have advice for students even after years off the stage. Carlo Wood, who graduated last year with a bachelor’s degree in business administration, said one of the most memorable moments for him as a CI leader was when a student’s mother thanked him at the end of the session. The mom told Wood she was not sure how her son, a man of color like Wood, was going to fit in at a school where students predominantly did not look like him, he said. But after the session, Wood said she told him she knew she was leaving her son in the right place. “To literally see someone who looks like you, or even hear someone else who is also first generation, I think those small details matter,” Wood said. At CI, he encouraged students to be different, and he said he vividly remembers taking a group to his favorite place in the city, the top of the Kennedy Center, and telling them to “let your freak flag fly.” That advice still rings true today, he said. While Olivia Martinez’s voice can no longer be heard on WRGW District Radio, she’s not done talking just yet. Martinez, who graduated in 2015 with a bachelor’s degree in political communication, gave incoming students tips on fitting in at GW and finding their niche, but one piece of advice really stuck, she said. Beyond seeking the best breakfast sandwiches, Martinez said she wants the Class of 2018 to remember to keep exploring. She said that students often use college as a time to learn about themselves and take risks with classes, but after graduation, you can get stuck in a rut of a job you aren’t passionate about. She said that just because students graduate, it does not mean the exploring has to end. “College being over can sometimes feel a little overwhelming and sad, but it’s also just the beginning,” Martinez said. Josh Bierman, who graduated in 2016 with a bachelor’s degree in dramatic literature, said he loved being on the Lisner Auditorium stage, whether it was performing for 14th Grade Players or leading students at CI. After his time as a CI leader, Bierman said his own Commencement ceremony was too blustery to enjoy. His family headed back to their hotel to escape the cold and didn’t listen to Cory Booker deliver his speech to the graduates. But if the weather holds up, Bierman said the Class of 2018 should enjoy the weekend celebrating their success. Getting to graduation is no easy feat, he said. Bierman said after graduation, he left Foggy Bottom to live at home, which was “not easy” after years of being on his own. It can be a tough time for graduates who don’t have a solidified plan after this weekend, but still take time to celebrate, he said. Jon Penniman, who graduated in 2016 with a bachelor’s degree in economics and finance, found his passion for community service on a whim at GW, so he joined the CI cabinet to make sure other students found their place too. Penniman said he told the now-seniors to stray from activities they did in high school. Exploring new options and being open-minded is how he found his passion for service through Alternative Breaks. Just like finding your place in college, Penniman said finding your passion post-graduation can take time, but you have to take risks to find your path.